Marshall Hargrave: From big bank breakups to activist interventions, 2015 could be a pivotal year for the nation’s largest banks. However, everyone seems to be getting on the same page when it comes to making this happen — from regulators to investors (including activist hedge funds). This comes as a lot of the low-hanging fruit in activist investing has been picked (think: forcing companies to sell themselves or pushing for share buybacks). Thus, activists will be turning to other parts of the market in 2015, with banking being one area of particular interest. Billionaire Nelson Peltz is already blazing a trail here; he owns a sizable stake in Bank of New York Mellon (NYSE: BK). He got a board seat late last year and is speculated to be looking into getting the bank to spin off its asset management arm. Granted, Bank of New York Mellon is no small bank with a $43 billion market cap, but it’s the really big banks that investors should be paying close attention to. 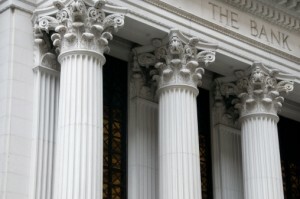 The big banks have to hold a lot of capital and the amount of capital they have to hold could go even higher if the Federal Reserve’s proposed capital requirements from December are put in place. But by breaking up, big banks would be able to re-invest excess capital and increase returns on equity. What I see as the pressing question for 2015 is this: Which bank with a $150 billion-plus market cap will be the first to break up? Few thought Goldman Sachs (NYSE:GS) would take the first shot, but the investment bank is calling for a breakup of JPMorgan Chase (NYSE: JPM). JPMorgan’s current business model includes five segments; consumer banking, investment banking, commercial banking, asset management and private equity. Goldman said that JPMorgan would be worth more if it were broken into four parts, which would be a full-blown breakup of the $220 billion market cap bank. Or, a more obvious option is to split the large bank into two, a traditional consumer bank and an investment bank. That type of split could be useful for a number of big banks on Wall Street. There are other opportunities for banks to split as well, not just simply separating consumer banking from investment banking. Some see potential for splitting up assets geographically, or splitting based on the customers they serve (think: retail versus institutional). Financial news site Reuters is also in on the action, saying that 2015 will be the year that activist investors target big banks. One of its top picks is Citigroup (NYSE:C). Like JPMorgan, Citi is another convoluted bank with consumer banking and investment services businesses. As well, it has a segment that is no longer part of its core business (known as Citi Holdings), which includes brokerage and asset management businesses. Along those lines, Bank of America (NYSE:BAC) is another possible target. It’s the second-largest U.S. bank by assets — behind only JPMorgan. Its three largest businesses are consumer banking, investment banking and investment management. But what could drive the upside beyond just having to hold large amounts of capital? A “conglomerate discount” in investing offers large companies with a variety of business lines trade at a discount to peers. That’s because large cumbersome businesses are more complex, harder to manage and tougher for investors to evaluate. So, what drives the upside is not just higher returns on equity for smaller banks, but also what Goldman calls “multiple re-rating.” It means that the banks would trade at higher price-to-earnings and price-to-book ratios if they were smaller. When looking at potential bank breakups, it is best to focus on names that have strong individual businesses. It doesn’t make sense to split up a bank if the individual business lines won’t be able to stand on their own. In closing: All three banks discussed here are large, cumbersome banks that would be best served broken up. And they all have solid individual businesses that could survive in the market standing alone. What’s more, the current valuations on these banks are also very enticing, with the three banks from above, trading at or below book value. Even without major breakups, these banks will perform well as long as the economy continues to strengthen. This article is brought to you courtesy of Marshall Hargrave from Wyatt Research.